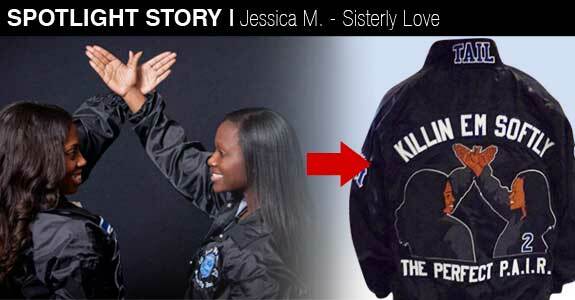 For Jessica and her line sister, the journey to jacket greatness started about seven years ago. They tossed around design ideas after initially joining their organization, but never landed on anything they loved. Years went by and when Jessica's tail got engaged, Jessica knew she had to get the perfect gift for her sister...the jacket of dreams. Now came the hard part, coming up with the dream design. Jessica struggled to naildown the artwork. The only thing she knew was that it had to capture the two sister's strong bond and ship name, "Perfect P.A.I.R." After consulting a friend and fellow S4G custom jacket customer, Jessica had an eureka moment. She realized that the best representation of her and her tail was an image of the two together. Jessica immediately thought of a senior photo, and though she'd "never seen detailed facial portraits" on a jacket before, Jessica depended on stuff4GREEKS to "accomplish the impossible." Jessica said "I surprised my line sister with our line jackets at her bridal shower. The attendees at the bridal shower commented on how creative the jackets were and discussed how the digitized image captured our likeness perfectly." Jessica's designs achieved all her goals and exceeded all expectation. 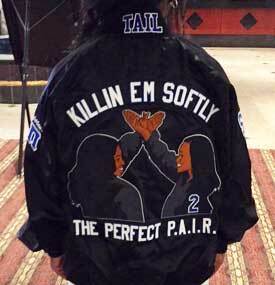 She said "There were also Sorors in attendance at the bridal shower and they “Z-Phi”ed as a sign of approval when they saw the jackets. We have also been stopped in public and had non-Greeks compliment us on the jacket design and discuss how detailed the jackets are. 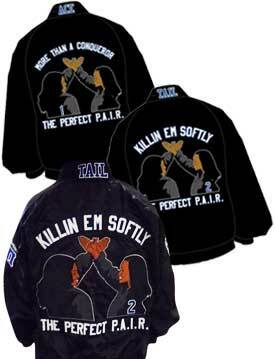 Others who have seen pictures of the jackets have stated that the jackets were dope, live, and perfect for the Perfect P.A.I.R."